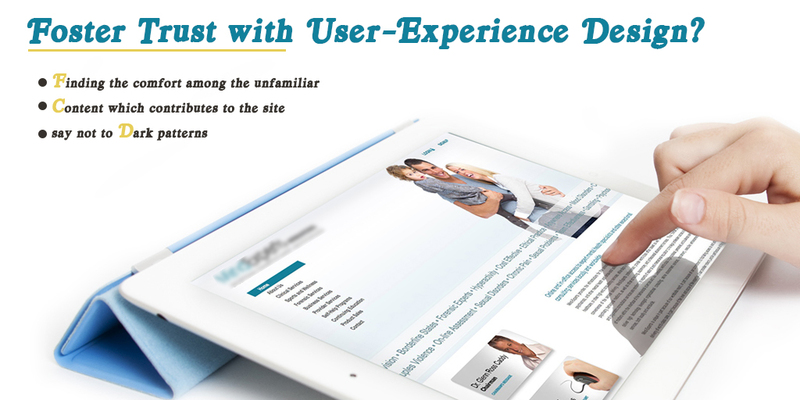 HomeWeb DesignHow to Foster Trust with User-Experience Design? Combination of our physical, emotional and logical responses into one confident, positive intuitive feeling is known as trust. Customers and consumers often uphold a level of expectation from brands when visiting their business and when those expectations are carefully cultivated, consumers tend to trust the brand and its business. The same is true for the online business and in online business there are number of cues which can reaffirm the trust or can also completely ruin any expectations which the visitor have and then reaction of the visitor is reflected in the revenue stream of the business and in the customer retention rate as well. A customer visits your site for the first time and knows nothing about it. The reason he is visiting because he has heard so much about your website from the other so he is there to give his luck a try and remember he still does not trust you. If your website can give this visitor confidence in the security, is designed with a clear hierarchy and he is able to navigate through it with ease finding solutions to his problems with relative ease you are not only creating but also enforcing his trust at the same time. The standards which hold true for the ideal customer experience who visits any shop in person holds true for the visitors who are visiting your website. On the other hand making wrong assumptions about the visitors, using misrepresentative photos, writing call to actions which mislead them and using software and plug-ins which slow down the website… these are all qualities without which your website would do better. Your website should represent what exactly you do and must convey the message immediately. If you are doing business in this in this millennium then your site should not resemble the one from 1960’s. By keeping your content up-to-date you will be able to send a strong message to consumers about how much trustworthy your company is. This is also true for the content on your website which must be modern, relevant, authentic and straightforward. It would not be in the interest of your business to post the picture of a large department store when you own a small shop of one room. The images and content create the initial gut feeling of the visitor’s experience when they visit your website. Don’t trick your customers into something which will shatter their trust, For example, if somebody sign up for your website then he will automatically start receiving your weekly or monthly letters. By doing this not only your letters will result in spam the user may altogether delete the account from your site. So, for such option provide them with choice of receiving the letters from you or they can simply sign up without subscribing the letters, newsletters or whatsoever. Dark pattern are interface decisions specifically placed to trick the users into doing something which is not beneficial to them and will harvest mistrust among the customers regarding your website and business. So, as soon as customers get a hint of dark pattern going behind the scenes they become skeptical of the company and its website. Respect your customers and make ongoing efforts in serving them through the design which they can trust and be able to build a long term relation with you. Can we automate web design with grids without destabilizing the designers?